No Senior Discounts! | That Mall is sick and that Store is dead! Another entrant in the “Death Of Newmarket North/Fair Mall” newspaper ad series. 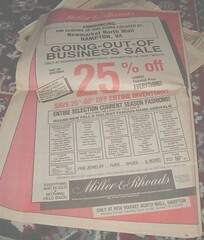 This was when Miller & Rhoads left Newmarket North mall (this was before the mall was renamed “Newmarket Fair” in 1990). When they left the mall started its death. Right after the store was closed, the remodel of the mall began without one of their anchors. The building that M&R was in is now a Verizon call center. I still miss Miller & Rhoads.